The trial for an elderly Russian lady Tamara Talashmanova who was arrested in Uzbekistan and faced 5 to 7 years in prison for carrying a pack of sedative pills Phenazepam has been canceled. According to the Sverdlov’s public television (Russia) which quotes a statement issued by the office of the Russian foreign ministry in Yekaterinburg, “this achievement is due to involvement of the Russian authorities”. The office of the Russian foreign ministry in Yekaterinburg, where the old lady comes from, has notified the headquarters in Moscow and the embassy of Russia in Uzbekistan of the situation around the Russian pensioner. Diplomatic mission in Uzbekistan has been immediately engaged into protecting a Russian citizen who has “found herself in an uneasy situation due to poor knowledge of the local legislation”. 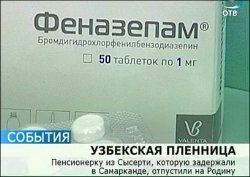 Phenazepam which was issued in Russia to Tamara Talashmanova on a valid prescription is considered as a narcotic substance in Uzbekistan. Staff of the embassy in Tashkent met both Tamara Talashmanova as well as the Uzbek law enforcement officers in charge of her case and made all efforts possible in order to facilitate the pensioner’s return home. As a result of the efforts made by the Russian foreign ministry and primarily the staff of the embassy in Uzbekistan, the trial for Tamara Talashmanova has been canceled and the criminal investigation has been terminated. The old woman has her foreign passport released by police and she is able to travel home. Currently, she is undergoing a medical examination and is scheduled to arrive home in Yekaterinburg on the 25th of May. Obviously, a lot of credit should be given to the Russian media. It is only after dozens of publications in the Russian newspapers that the case has come to the attention of Tatiana Merzlyajkova, the human right commissioner in the Sverdlow province of Russia and further to Vladimir Lukin, the Russian Ombudsman, who in turn have notified the Russian ministry of foreign affairs.